Iconic Hip-Hop producer and DJ Marley Marl is the most recent guest on Ice-T’s Final Level Podcast. The man largely responsible for introducing the music community to Big Daddy Kane, Kool G Rap, Biz Markie, and countless others sat in with Ice and Mick Benzo for nearly 90 minutes. As the structure of the O.G.’s talk show, the Queens, New York legend joined the Rhyme Syndicate founder to discuss politics, sports, television, video games, and more. However, approaching the 48:00 mark, Ice and Mick interview the Juice Crew co-founder, and from a historical Hip-Hop perspective, things get nothing short of jaw-dropping. Asked about his first truly produced record, Marley Marl explained his ambitions of forming a Rap squad prior to the Juice Crew. Marlon Williams recalled working with Dimples D., who famously made “Sucker DJ,” originally as a Party Time Records single. However in the crew’s dealings with Marley, the Queensbridge Houses native said he could not translate the stage energy to the studio. The group disbanded without a record. Marley explained that he was merely producing reels, for his WHBI radio show with Mr. Magic, and other events. One record in particular sampled The Honeydrippers’ 1973 single “Impeach The President,” with a fellow Q.B. artist, MC Shan, simply talking about his neighborhood. “Even when I did ‘The Bridge’ with MC Shan, that wasn’t supposed to be a [true record],” began Marley. “That was background music for Band Day in Queensbridge—like intermission music, for in between the bands.” Marley maintained that Shan’s now-famous bars are merely intended to show civic pride—not an indictment on other boroughs, especially the Bronx. “[MC Shan] did the intermission song, talkin’ about Queensbridge. ‘This is a little story about where we come from.’ That’s what he said, ’cause that was intermission music. So while they played that music, the bands were changing on stage.” What was only heard by a community of concert-goers in 1986 would become one of Rap’s biggest, and most controversial singles. Asked how the one-off reel became a Prism Records hit, “It leaked out,” said its producer. Still, Marley feels as though that record does not qualify as his true breakout first production. “See, we gettin’ the truth here! Break it down!” exclaimed Ice-T at one point. 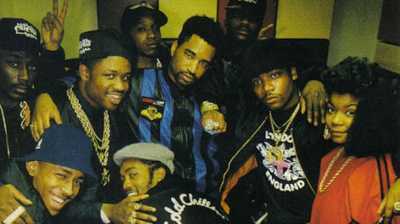 Marley Marl recalled the Boogie Down Productions members deeply upset by Mr. Magic’s reaction. The DJ remembers gathering his personal belongings from the studio, anticipating an altercation. “It looked like it was not a good situation. They was mad at Magic. They lookin’ at him all crazy ’cause he dissed them. I said, ‘Let me just get up outta the studio.’ I [was recording with Roxanne Shante], so I left. I forgot the reel.” The DAT reel that Marley Marl left behind, as he claimed, was the drum tracks to what would eventually become an answer record to “The Bridge,” B.D.P.’s “The Bridge Is Over.” Marley continued, “That’s the reel that Ced Gee found, and put up, and would make ‘The Bridge Is Over’ with my drum sounds.” Ced Gee, who co-founded Ultramagnetic MC’s, reportedly built upon Marley’s arrangement. Did I co-produce ‘The Bridge Is Over’? hypothetically asks the man who would later make an entire 2008 album with KRS-One, called Hip-Hop Lives. Later in the interview, Marley Marl explains being Eric B.’s roommate, working with Rakim, and more. For those interested, Marley does say that 1985’s “Marley Marl Scratch” is what he believes to be his first true production.